For the longest time, I approached holiday meals as an opportunity to veganize anything and everything. 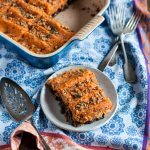 The way I saw it, people crave tradition, especially at this time of year, so it was my task to take every classic Thanksgiving or Christmas recipe and render it vegan. It led to a lot of fun kitchen experiments and at least a few holiday recipe keepers–my sweet potato lentil shepherd’s pie, cabbage rolls, and (most recently) vegan cornbread sage stuffing among them. Lately, though, I’m starting to approach holiday meals not as a mandate to veganize classics, but rather as an opportunity to simply cook the food I love. 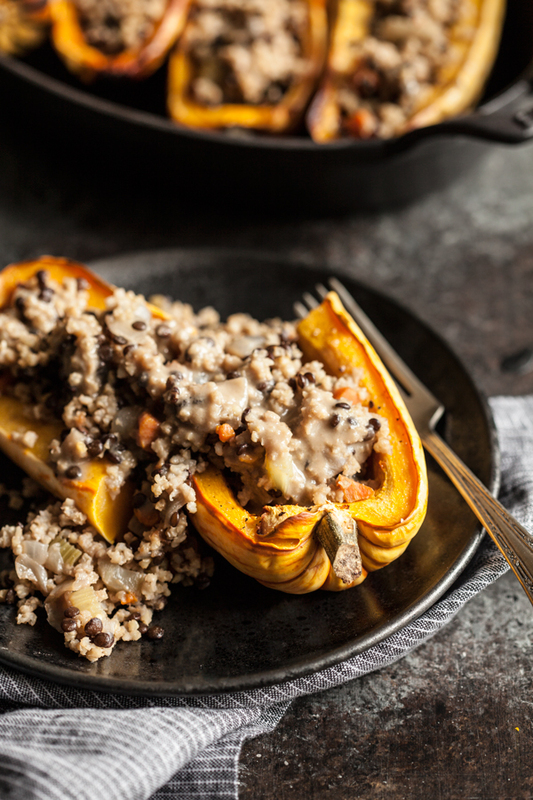 These millet & black lentil stuffed delicata squash are a perfect example of a holiday entree that’s festive and great for crowds, but which doesn’t feel like a forced attempt to hew to tradition. They’re wholesome, hearty, earthy, and they make a very pretty presentation, too. For the past month or two I’ve been experimenting with cooking grains and lentils simultaneously (most recently, in my one pot Italian quinoa and lentils). I used to always cook lentils separately from grains, folding them in after they were fully cooked, but I’m realizing that it’s not difficult to cook most lentils along with a grain that takes a similar amount of time (about 20-30 minutes). It saves me an extra pot to clean and streamlines the cooking process. It’s not a perfect method; lentils can vary in cooking time depending on how fresh and how dry they are, so occasionally I’ll end up needing to add more water to the grains and lentils as they simmer. Most often, though, it works like a charm, and if I pre-soak my lentils overnight, they virtually always finish cooking as the grains do. Win, win. 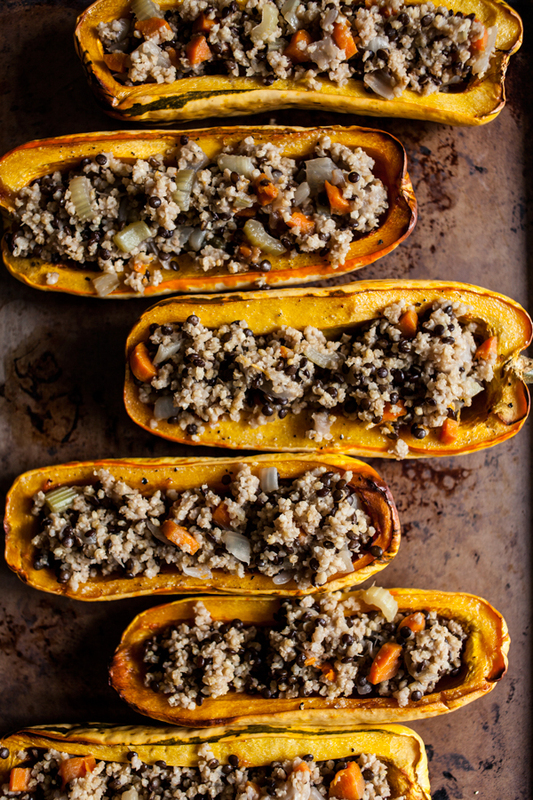 That’s the idea behind this millet and black lentil stuffing, a simple, toothsome, and nutritious mixture that you can serve as a simple pilaf or with the roasted squash, as illustrated here. 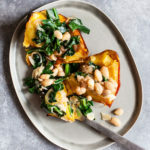 Stuffed vegetable dishes can be quite an undertaking, but using delicata squash ensures quick roasting time (35 minutes or less, unless your squashes are really big). 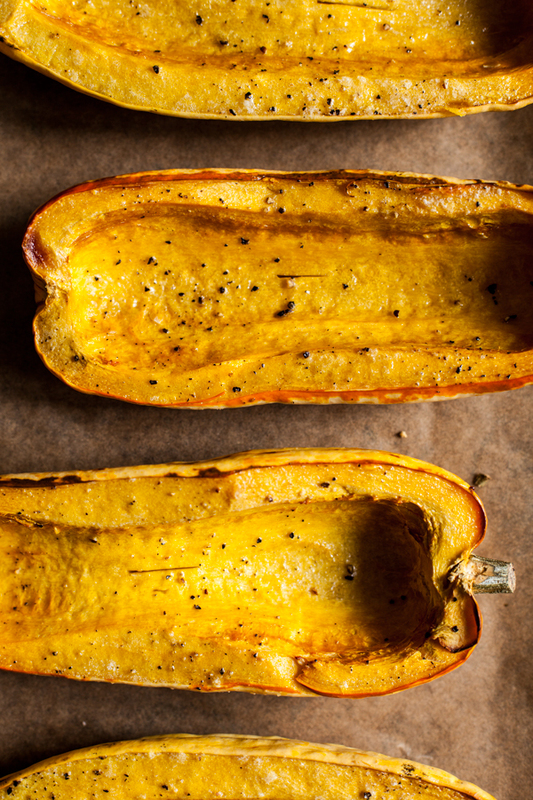 I love the flavor and texture of delicata squash, and this recipe allows them to shine. Preheat your oven to 400F and line two baking sheets with parchment or foil. Spray or brush both sides of the squash with oil. Place the squash, cut side down, on the baking sheets. Roast for 25-35 minutes, or until the squash are fork tender and browning. While the squash halves roast, heat the oil in a medium sized pot. Add the onion, celery, and carrots. Cook, stirring every now and then, for 5-7 minutes, or until the onion is soft and clear. Add the garlic and millet. Toast the millet for about 2 minutes, or until it smells a bit nutty. Add the salt and broth. Bring the millet to a boil, reduce the heat to low, cover, and simmer for 20-25 minutes, or until the lentils are tender (but a little al dente) and the millet has absorbed all of the liquid. Remove the millet from heat and allow it to steam while you make the gravy. To prepare the gravy, heat the flour and nutritional yeast in a small saucepan over medium heat. Stir them frequently, and continue cooking until they smell toasted and the flour is just golden (about 5 minutes). Remove them from heat and whisk in the vegetable broth, tamari, olive oil, thyme, and garlic powder. Return the mixture to low heat and cook, whisking constantly, until the gravy is thick and bubbly. Season to taste with black pepper and remove from heat. When the squash halves are ready, flip them over. 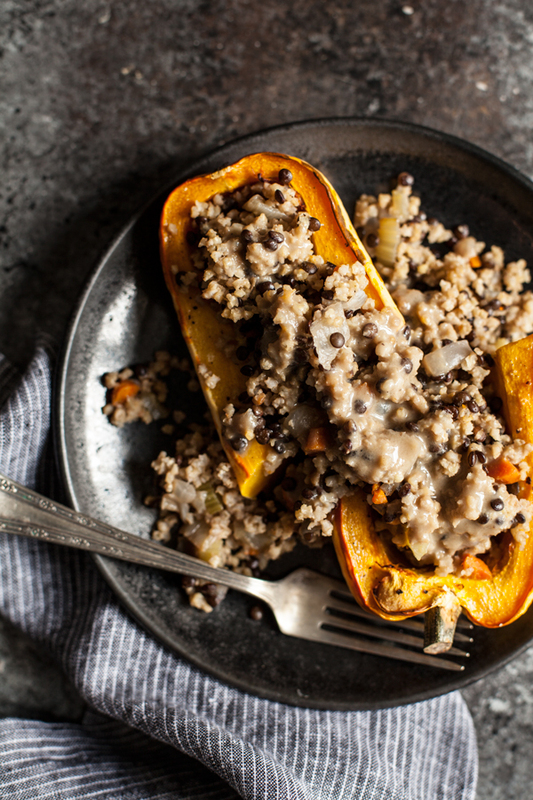 Taste the millet and black lentil stuffing and adjust salt and pepper as needed. Stuff each squash half with the stuffing, then top with the gravy (or another sauce or dressing). Serve. 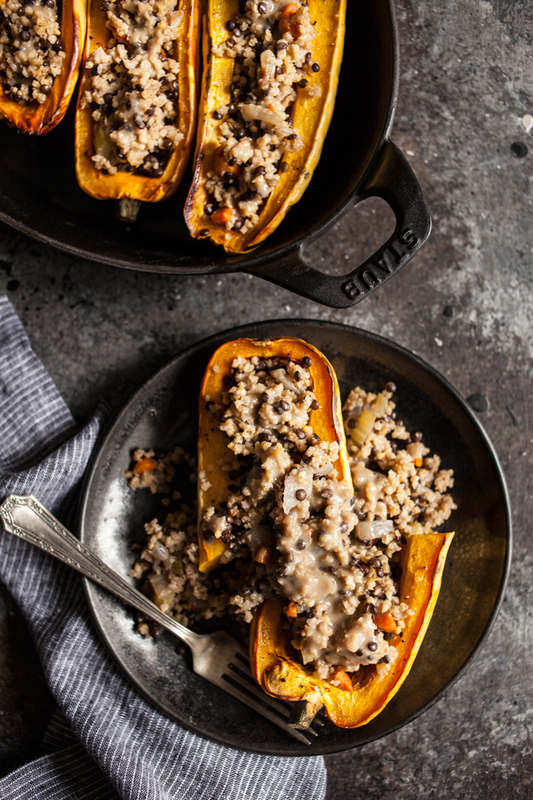 Millet and black lentil stuffing can be prepared a day in advance, and the squashes can be roasted a day in advance. Gravy can be prepared up to 2 days in advance, or frozen for up to 3 weeks. As you can see, I couldn’t resist whipping up a batch of my go-to, simple vegan gravy to top the stuffed squash, though I’d suggest that they don’t need the gravy. 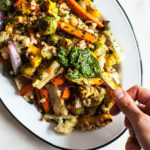 It takes minutes to make, so it’s worth it if you’re a gravy lover, but you can also use a tahini dressing or a simple handful of chopped fresh herbs to top the squash if you’re short on time. When the millet and lentils were done, I was worried that the color might be a little too bland, but the beautiful, golden millet halves keep the dish festive and pretty. If you’d like to make it even more festive and colorful, you can top it with some dried cranberries (or cranberry sauce) before you add the gravy. No matter what, this is a hearty and healthy dish to bring to any gathering–or to simply enjoy on your own. If you’re not planning to serve this to a crowd, the recipe can be halved and made to serve four instead. I haven’t figured out precisely what I’m contributing to my family’s Thanksgiving meal this year, but I can say that this recipe is a decided contender. Perhaps it’ll end up on some of your tables, too–either sooner or later. With that, I wish you a great end of the week, and I’ll be back for weekend reading. This post was created in partnership with the USA Pulses and Pulse Canada. Opinions are my own. Thank you for your support! To learn more about the Pulse Pledge, visit www.pulsepledge.com. This seems absolutely delicious! And the gravy on top… Perfectly on point! This looks SO delicious Gena! Delicata squashes are hard to find over here, so I think I will give this a go with another variety. Another winner! You had me right away and then the suggestion of topping this with cranberry sauce really got me excited. Can hardly wait to make this. Yum. Since I have become a vegan, I have really started to love lentils. They are so healthy and they taste amazing. I will try it this week! This was wonderful to make. I used brown rice as I did not have millet. This is a winner. Thank you. Couple questions – in the text of the article you mention soaking the lentils to have the same cook time as the grain – are the black lentils soaked over night here? Also, do the lentils go into the pot at the same time as the millet – do you toast the lentils as well? Or do they go in after the millet has been toasted? Thanks so much for the wonderful recipes! Wishing you a marvelous new year! I don’t toast the lentils. I usually soak them for a few hours, but overnight would be just fine, too. This looks great! Could you suggest how you would reheat if you did it all in advance? Thanks! I’m so glad! I’d put the stuffed halves in a baking dish, cover with foil, and heat in a 350 oven for 15-20 minutes, or until warm 🙂 Enjoy! Thanks! Can’t wait to try them tomorrow.